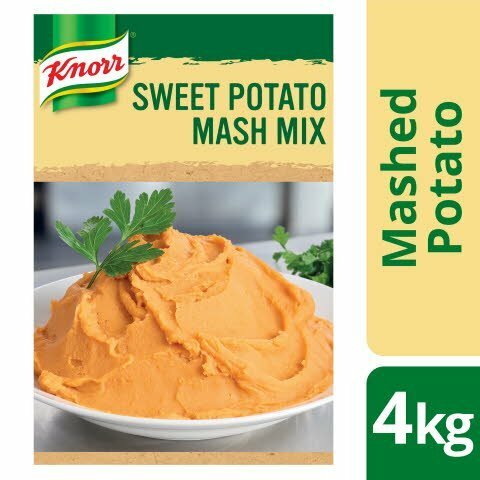 KNORR Instant Sweet Potato Mash Mix creates a creamy and delicious, fresh tasting sweet mashed potato. Quick and easy to make, simply add boiling water and whisk. It is ideal served with meat, vegetable dishes and casseroles, or use as a cooking ingredient to top, coat or add extra flavour to meats. Use as a cost saver by adding volume and bulking up dishes such as soups, casseroles and curries from single to multiple portions. Using the servings quantity table below, bring the required quantity of water to boil. Turn off heat, sprinkle in KNORR Instant Sweet Potato Mash Mix and whisk until smooth. Serve or keep warm in a bain marie. Note: Add less water to create a firmer mash or extra water if a smoother mash is required. Weight - 4 kg. Dry mix wt serving/portion - 18 g.
Made from Real Potato & Sweet Potato. To keep fresh, seal foil bag tightly. Once opened use within 2 weeks.